Borla Performance Industries has released a performance Cat-Back™ system for the Mazda 3. Many were nervous when Mazda elected to replace the popular Protégé with the Mazda 3, but the resulting vehicle is a homerun. The 2004-09 Mazda 3 is a great 4-door with an excellent power package in the 2.3L 160 horsepower engine and performance handling suspension straight off of the Mazda 6. BORLA engineers have developed an awesome performance Cat-Back™ system (PN 140121) that has a super look, sound and performance. Designed to work with both automatic and stick shift transmissions, this performance exhaust upgrade is lighter than stock and has 14% better air flow which generates solid performance gains through the entire dyno RPM graph. 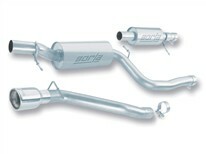 BORLA, the original pioneers of aerospace-grade high quality austenitic stainless steel (superior to 409 or aluminized steel) free-flow exhaust utilizes patented award and race winning technology to deliver quality, sound, performance gains and enhanced fuel economy — all with an easy bolt-on installation and backed by an unsurpassed written Million-Mile Warranty.